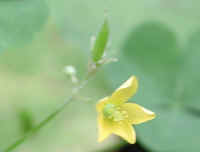 (Wood-Sorrel, Creeping (Oxalis corniculata) - 01) The five-petaled flower of the creeping wood-sorrel is only about 1/4 inch across, or half the size of the yellow wood-sorrel flower. 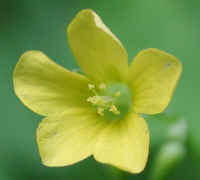 This is one of the ways of distinguishing the two species of flowers. 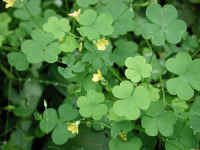 (Wood-Sorrel, Creeping (Oxalis corniculata) - 02) The leaves of the creeping wood-sorrel are palmate with three heart-shaped leaflets. 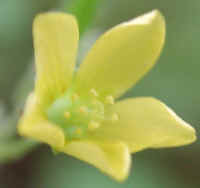 The leaves and flowers grow on separate stems. 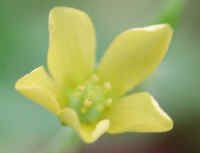 To the right, we can see a flower, a bud, and a seed pod. (Wood-Sorrel, Creeping (Oxalis corniculata) - 03) This is a bee's eye view of one of the creeping wood-sorrel flowers. (Wood-Sorrel, Creeping (Oxalis corniculata) - 04) This is another close-up of a creeping wood-sorrel flower with its one pistil and ten stamens. (Wood-Sorrel, Creeping (Oxalis corniculata) - 05) Because of the small size of the creeping wood-sorrel flower, and the lack of good contrast, we had trouble focusing the camera on the inside of the flower so that all of the intricate detail could be seen clearly. (Wood-Sorrel, Creeping (Oxalis corniculata) - 06) In this bee's eye view of a 1/4 inch diameter creeping wood-sorrel flower, we can more clearly see the brown dots at the base of the petals, the one pistil and ten stamens. (Wood-Sorrel, Creeping (Oxalis corniculata) - 07) This is a small patch of creeping wood-sorrel, showing the trailing main stems and the branching leaf and flower stems. (Wood-Sorrel, Creeping (Oxalis corniculata) - 07a) Just below the creeping wood-sorrel flower are some buds encased in a dew drop. 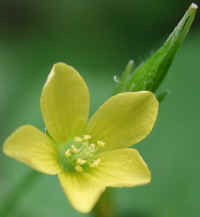 Also note the relatively small size of the flower compared to the heart-shaped leaflets that make up each palmate leaf. 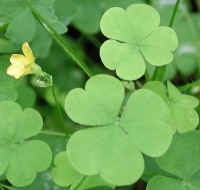 According to the literature, the leaves of the creeping wood-sorrel have a somewhat sour lemon-like taste, which add a little boost to green salads. (Wood-Sorrel, Creeping (Oxalis corniculata) - 07b) This is another close-up view of the creeping wood-sorrel flowers, buds and leaves. 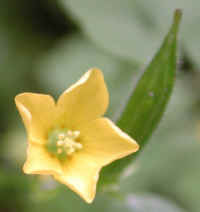 This photo also presents a good example of a branching flower stem with its several flowers. 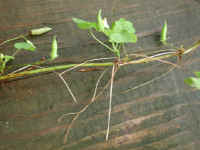 (Wood-Sorrel, Creeping (Oxalis corniculata) - 08) We laid one of the trailing main stems of the creeping wood-sorrel on a piece of wood to show the way this wildflower sends out roots at the same juncture where the flower and leaf stems develop. Four seed pods are also visible in this photo. 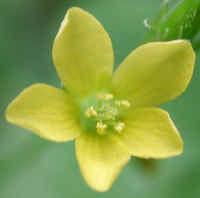 (Wood-Sorrel, Creeping (Oxalis corniculata) - 09) This is anther close-up look at a creeping wood-sorrel flower. We are constantly being awed by the intricate attention to detail that went into creating these flowers and the whole of God's creation. (Wood-Sorrel, Creeping (Oxalis corniculata) - 10) Another close-up of the creeping wood-sorrel flower. 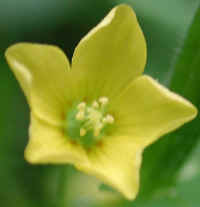 In this photo, the petal veining is more clearly visible. (Wood-Sorrel, Creeping (Oxalis corniculata) - 11) In this bee's eye view photo, we're focusing more on the ten stamens and one pistil.